In a session lasting little more than an hour, the Oconee County Board of Commissioners last night all but wrapped up its discussion of the 2015 Special Purpose Local Option Sales Tax referendum to be on the ballot in November. The Commissioners agreed to include $47.3 million in projects in the list that will go before voters, who will have to decide if they want to continue the 1 percent sales tax to fund the items. The Commissioners made relatively minor changes in the list they tentatively had agreed to back on March 3, before deciding the next night to move the SPLOST referendum from the May 20 ballot to the Nov. 4 ballot. The BOC is scheduled to take its first formal action on the agreed-upon project list at its agenda-setting meeting on Tuesday night and to adopt a resolution calling for the SPLOST referendum with its list of projects on June 3. Last night the Commissioners increased funding for water and sewer projects by $2.1 million, but that decision reflected a change the five had agreed to on May 6 when they shifted monies around in the current SPLOST. They decreased funding for law enforcement by the same amount last night, again reflecting the deal reached on shifting current SPLOST spending earlier this month. They also added $500,000 to the $1 million previously agreed upon for Civic Center renovations and $750,000 to do something to improve the current facility used by Animal Control. What actually will be done for or with the Animal Control facility in the far south of the county was left unresolved. The five agreed to increase funding for parks and recreation projects by $250,000 to compensate for a planned shift in spending priorities in the current SPLOST. The current parks and recreation category includes historic projects, and the Board decided to make sure $250,000 actually is set aside for that purpose. In addition, the Board agreed to add $250,000 to the 2015 SPLOST for historical and cultural preservation. In the end, the money allocated was more than is projected to come in from tax collection, and the Board decided to rectify that problem by taking $280,500 from the previous allocation to Fire Rescue. The five said they would find some money, perhaps from the sale of the property in Farmington from the old fire house, to cover the loss. The county has just opened a new fire station in Farmington. The chart below shows the figures agreed upon last night in purple. The figures tentatively agreed upon in March are in yellow. 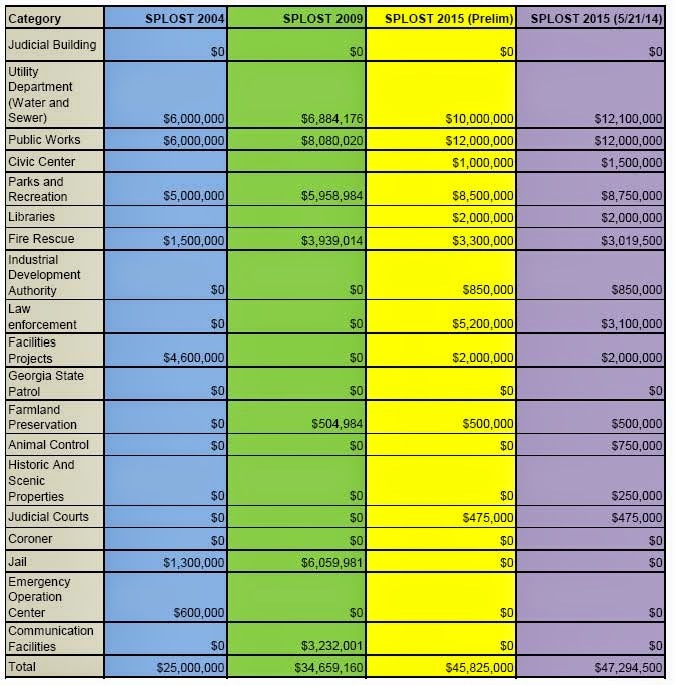 The column in green is for funding in the current SPLOST, and the column in blue is from the 2004 SPLOST. No money was requested for the jail, emergency operation center or communication facilities for the 2015 SPLOST. 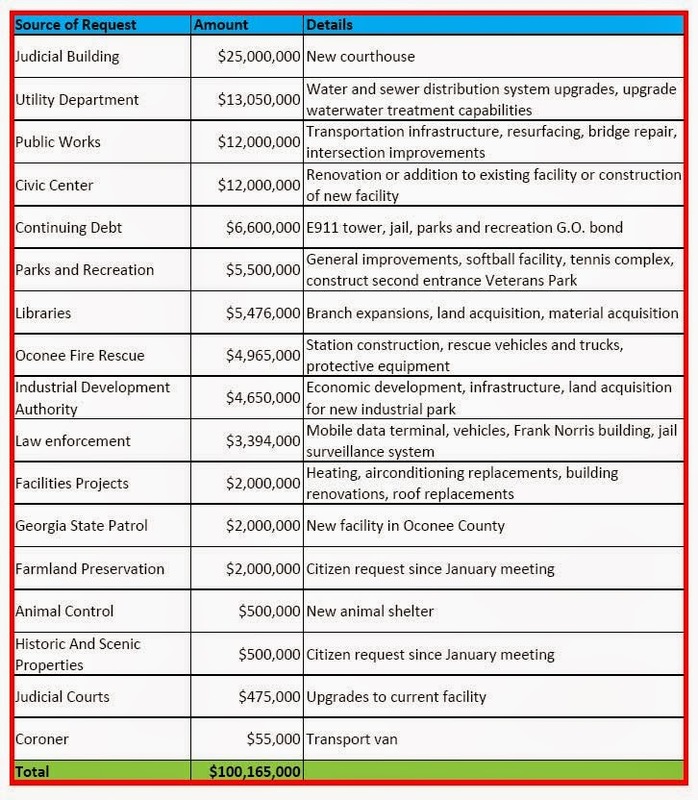 The money requested for SPLOST 2015 originally totaled more than $100 million, as shown below. 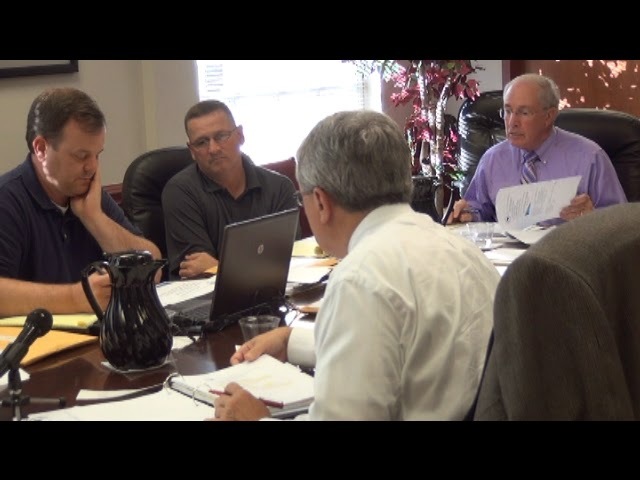 The full video of the meeting is available on the Oconee County Observations Vimeo site.